We are finally here. 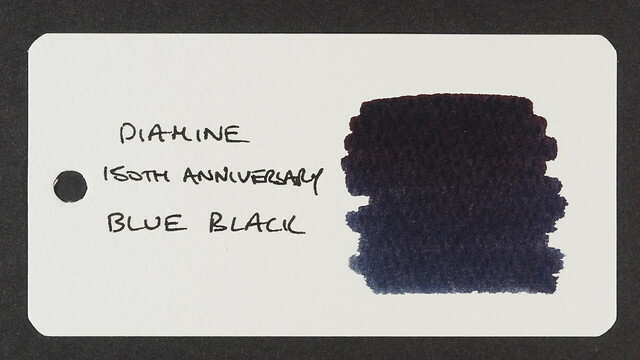 This is the first in a batch of eight ink reviews for the Diamine 150th Anniversary inks, in this case for 1864 Blue Black. 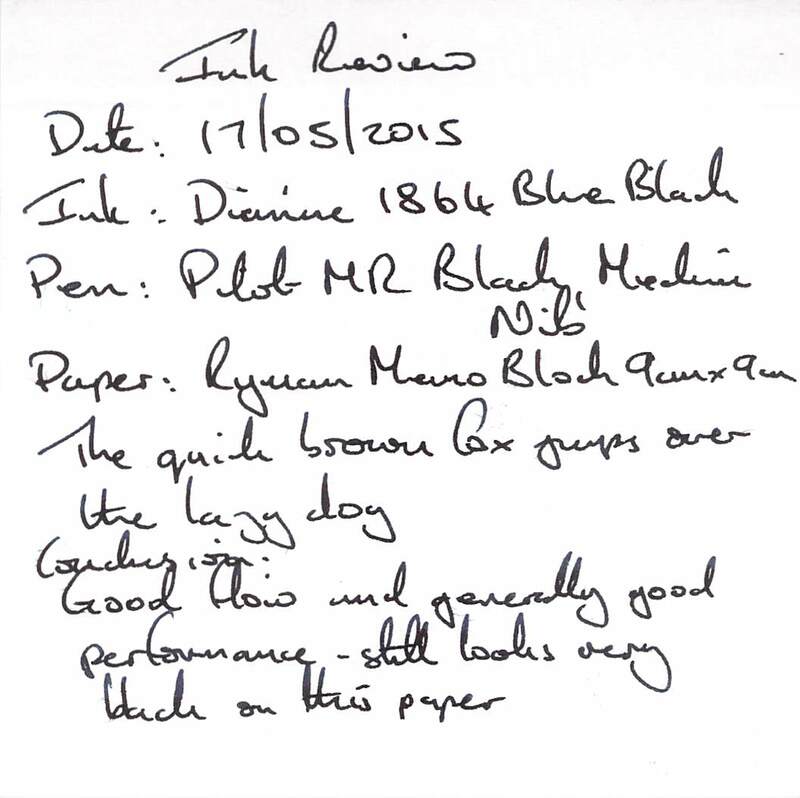 This is my first review of a Diamine ink, despite the fact that I own more of their inks than from any other manufacturer (including Noodler’s). 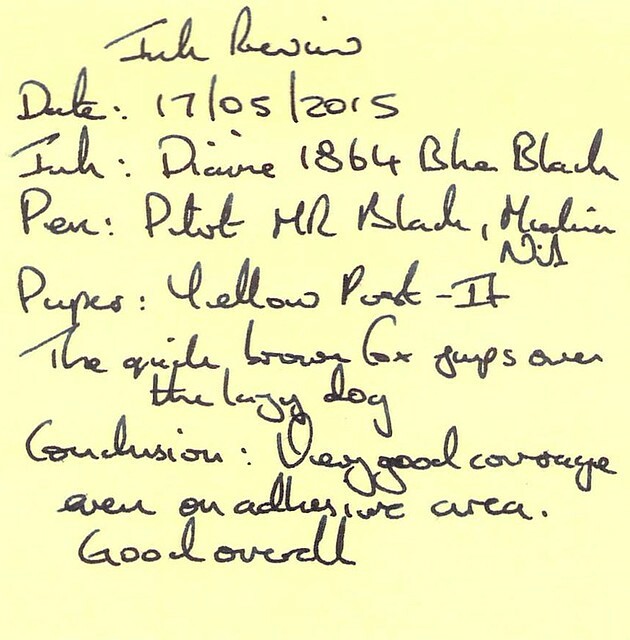 It was even a Diamine ink that helped to restart my interest in fountain pens (but that’s a story for another time). 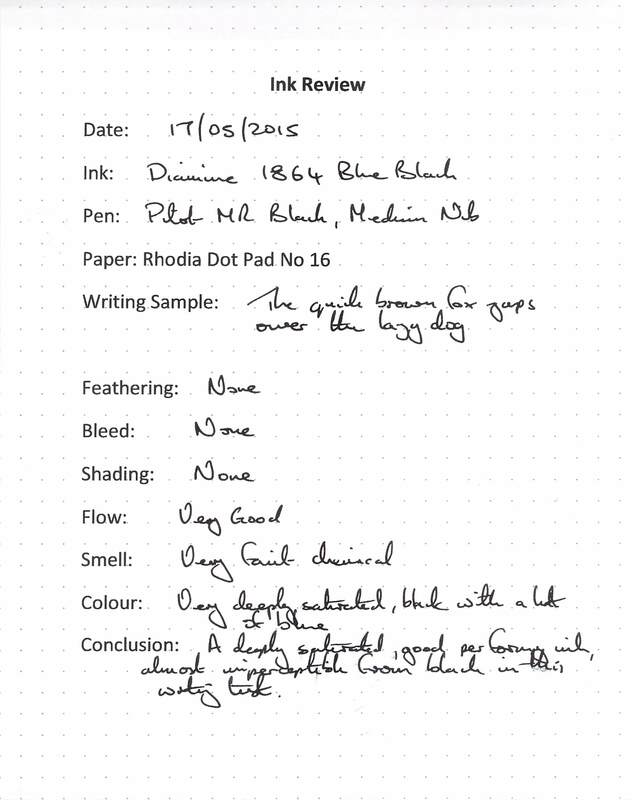 So why has it taken so long to start reviewing Diamine inks? Since the are UK inks, and I live in the UK, perhaps it’s an element of “familiarity breeds contempt”, but that seems a bit harsh. 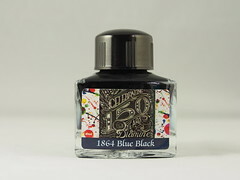 Maybe it did take the release of the 150th Anniversary inks to give that extra spur to stimulate a review. 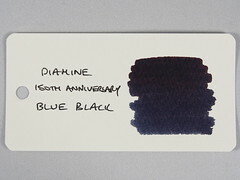 The inks were released to celebrate the founding of the Diamine company in 1864, and the Blue Black is unique in the set by including “1864” in the otherwise purely descriptive name. 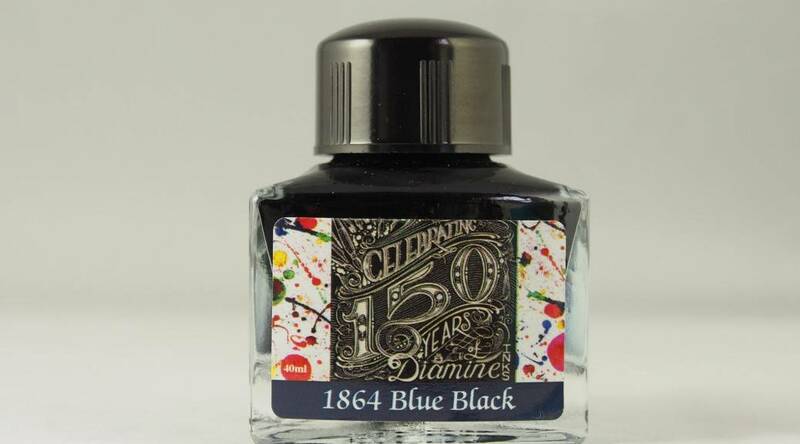 The ink cost £7.75 (including VAT), for a 40ml bottle, from a UK supplier. This is more than twice the price of standard Diamine inks (which typically retail for less than £6.00 for an 80ml bottle). I would therefore consider this ink to be moderately priced. 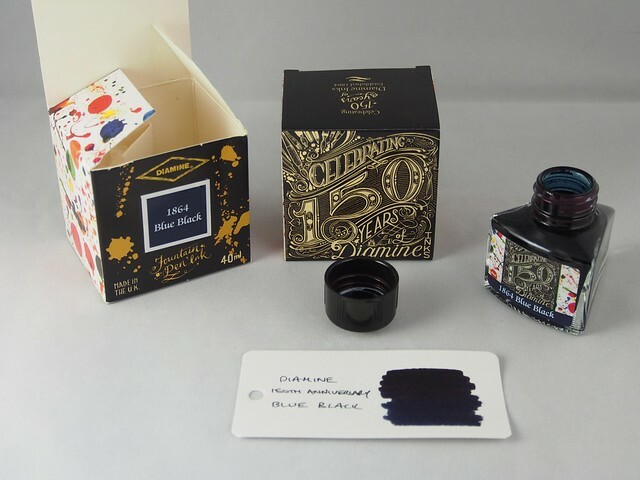 The box is far more busy that the typical industrial Diamine box, with lots of coloured ink spots on both sides and a nice design on the back. The underside of the box credits the design to inkymole.com. On the front of the box is a sticker giving the name of the ink in white with a close approximation of the colour as the background. It was only when writing this review that I realised it was a sticker, and even then only because it had been stuck just outside the guides. I have one minor gripe about the box – because it contains a bottle that is shaped like a slice of cake or cheese a small piece of cardboard with bubble wrap has been inserted to keep the bottle in place. While this works, it doesn’t stop the box from deforming, increasing the wear and tear on the box over time. It’s a bit clunky and detracts a little from the obvious care that has gone into the outward appearance of the box. The bottle, as stated before, is shaped like a cheese or cake segment, so all eight bottles can form a circle. I imagine almost everyone who has bought all eight bottle has tried that. The plastic bottle cap is the usual Diamine standard – I initially thought it must be smaller, but it isn’t. The neck of the bottle is also quite narrow (which is my only criticism of the standard Diamine bottle). The label repeats the ink spots, the design from the back of the box, along with the name of the ink on the background of the same colour. As I’ve indicated before I’m not a great fan of ostentatious boxes and boxes, and I’m glad that Diamine resisted the temptation to go too far in this case. 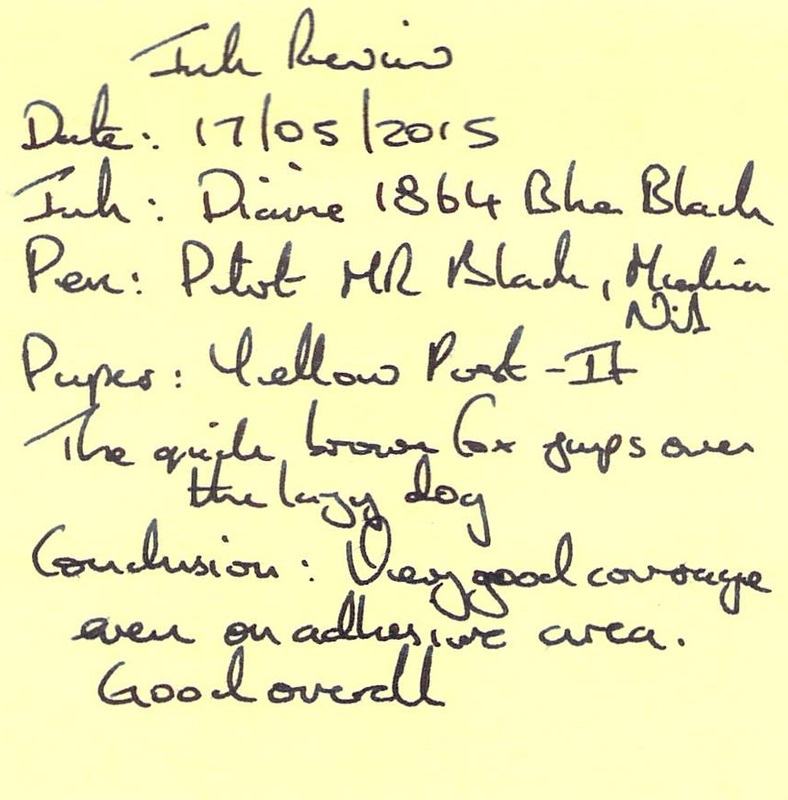 The test pen on this occasion was a black Pilot MR with a medium nib. The ink showed no water resistance and text was obliterated by water drops. 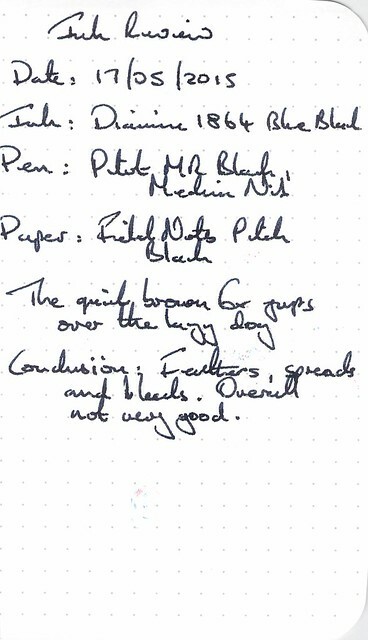 Cleaning was very easy – which was a bit of a surprise considering that the pen had been inked for several weeks. Drying time was around 30 seconds on Rhodia paper. This is my first review using a new pre-printed template to improve the layout and to make it less likely that I will forget something important. I have taken this opportunity to lose “Nib Creep” which is a factor that’s never really been important to me and I’ve found difficult to assess in the past. The ink performed generally very well on this paper, but there is once important issue – the ink still smudges easily even when dry. Maybe this is linked to the lack of water resistance and the ease of cleaning. The test pen is quite wet and the deep saturation actually makes the ink look almost black, with only a hint of blue. Still generally good performance, but the ink still smudges. Okay performance, but even smudges here. 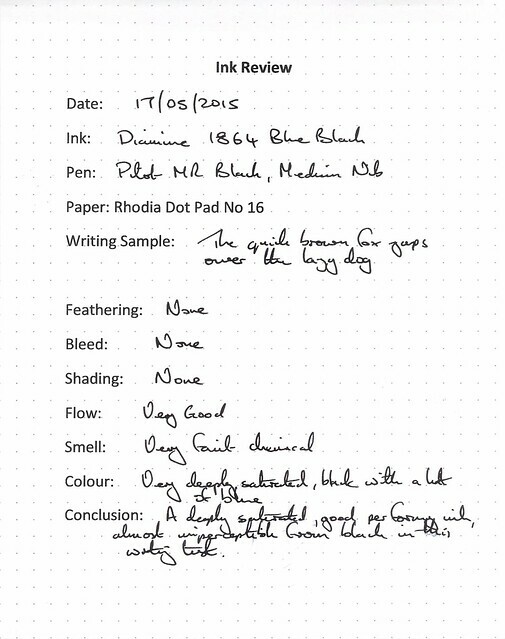 On this more absorbent paper the ink didn’t smudge, but it looks like ink has transferred from other writing samples done as part of the same batch. It’s only really on the Word Card that the blue comes through. When doing the writing samples I really liked this ink, although in the test pen it came out as more black with a hint of blue rather than a blue black. It’s only when i came to write up this review, and I handled the writing samples again, that it became clear just what an issue the smudging could be. Although the deeply saturated colour is attractive, it’s not enough the counterbalance the smudging, so I wouldn’t use this ink for note-taking on a good quality paper – it could end up everywhere. Considering how easily the ink smudges, just from the moisture on my hands, it’s now less of a surprise that the pen was so easy to clean. I may try it again in a drier pen, possibly with a finer nib, to see if that makes a difference, but for the time being it’s not a candidate for my usual rotation, which is a shame.